Below are common attributes associated to White Out Knock Out Rose. Become a care taker for White Out Knock Out Rose! Below are member comments regarding how to plant White Out Knock Out Rose. No comments have been posted regarding how to plant White Out Knock Out Rose. Be the first! Do you know how to plant White Out Knock Out Rose? Below are member comments regarding how to prune White Out Knock Out Rose. No comments have been posted regarding how to prune White Out Knock Out Rose. Be the first! Do you know how to prune White Out Knock Out Rose? Below are member comments regarding how to fertilize White Out Knock Out Rose. No comments have been posted regarding how to fertilize White Out Knock Out Rose. Be the first! Do you know how to fertlize and water White Out Knock Out Rose? Below are member comments regarding how to deal with White Out Knock Out Rose's pests and problems. No comments have been posted regarding how to deal with White Out Knock Out Rose's pests and problems. Be the first! Do you know how to deal with pests and problems with White Out Knock Out Rose? Looking for White Out Knock Out Rose? Get White Out Knock Out Rose fresh and large directly from the grower to your garden! 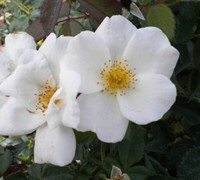 Buy White Out Knock Out Rose online from the nursery wholesalers and save BIG! Plant the White Out Rose in a location that provides well-drained soil and all day sun to morning sun with afternoon shade. All roses appreciate the morning sun because it dries dew from their leaves, prohibiting development of fungus and disease. That being said, Knock Out roses are the most disease-free roses in the world. Roses appreciate some shade in the afternoon in hotter climates. Pruning the White Out Rose is easy. Not only are they the most disease-free roses in the world they are easy to care for in every other way. Knock Out Roses should be pruned heavily in early spring, just before or after new red foliage begins to emerge. At this time, cut the shrub back to about 12-18" above the ground. This ensures that the plant will have a good habit and healthy blooms throughout the season. To encourage heavier bloom, you can prune the White Out Rose lightly throughout the active growth season to remove faded blooms. Discontinue pruning about 2 months before typical first frost date in your area. I fertilize my White Out Rose with a mild, natural plant food in early spring when the new growth begins to emerge and then about every 4 to 6 weeks throughout the season. I stop fertilizing them about two months before the first frost date. Frequent fertilization promotes increased blooming and deeper green foliage. I've seen no serious pest or disease problems with any of the White Out Rose. Consistently wet soil can cause problems with the roots.